King Louis XIV’s bold move for greatness will endanger his relationships when Season 2 of Versailles premieres on Ovation TV in 2017. The international hit series examines the reign of the Sun King who built Versailles, the most beautiful palace in Europe. He confounded his court, his advisors and his people with the building. 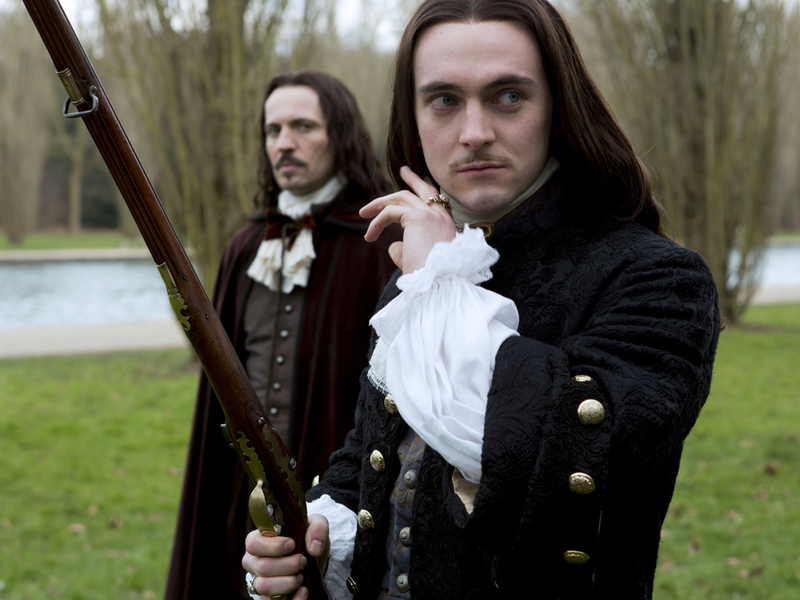 George Blagden and Alexander Vlahos return as King Louis XIV and his brother, Philippe de France, respectively. Anna Brewster stars as Louis’s mistress, Madame de Montespan, and Stuart Bowman plays his valet, Bontemps. Other returning cast members include Tygh Runyan as enforcer Fabien Marchal, and Evan Williams as the Chevalier de Lorraine, Philippe’s lover. After completing Season 2 production last summer, cast members came to the U.S. to promote Season 1. During an interview at the time, Blagden teased King Louis’ growth in Season 1. King Louis begins as a “son king” who is ruled by his regent-like mother and counselors but transforms himself into the powerful Sun King history tells us Louis was. In Season 2, the king continues to build himself into an omnipotent ruler, Blagden said. According to Ovation, Louis’s passion for Madame de Montespan will blind him to the treachery overtaking his beloved Versailles. He refuses to listen to the counsel of the church and his closest advisors. Even his closest friend, Bontemps—if the king of France truly considers a subject his friend—feels the sting. Events will test the valet’s relationship with the king in Season 2, Bowman said last fall. He cited the Season 1 scene when a feverish Louis accused Bontemps of plotting against him while the loyal valet was trying to help the king. That scene, Bowman said, showed how much Bontemps loves his charge and how devastating it is when the king takes away that friendship. Ovation TV, America’s only arts network, broadcast the first season beginning Oct. 1, 2016. The premiere remains the most-watched telecast for the network. Simon Mirren, David Wolstencroft, Claude Chelli, Jean Bureau, Anne Thomopoulos serve as executive producers. Thomas Vincent, Mike Barker and Louis Choquette direct Season 2 episodes. Jalil Lespert directed Season 1. Sadly they have not announced an exact date yet. I want to know too and I keep asking! But I will post as soon as they tell me. Amazing actors in the most incredible setting on earth. I love it too. Kinda crazy that they will be nearly done or done filming Season 3 by the time we get to see Season 2 in the U.S. Looking forward to more. Favorite show of all time……Waiting for its return! Ovation we’re waiting! Please email me when you have a date! Watch S1 uncut on Netflix while waiting. I definitely will write when I know more on S2! Please let us know when Versailles is returning!!!! I definitely will write when I know! Can’t wait for Versailles return! I can’t wait… what’s the date? Ovation has not announced the date yet. The absolutely beautiful men, their clothes, takes me to a time I love. Can’t get enough. More please. May u also say George, and Alexanders acting is superb. Bravo gentle man. LOVE LOVE LOVE VERSAILLES GREAT SHOW HOPE THEY KEEP IT GOING FOR SEASON 3 AND A 4.